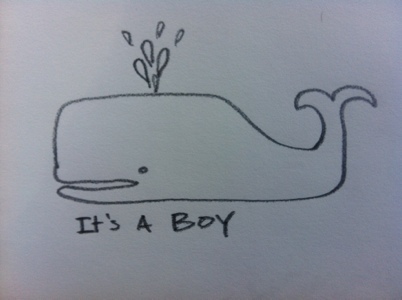 I have been drawing a lot of whales lately. I can’t say that I have really ever tried to draw one before, so it was a bit of a learning process, as you can see from my sketch pad below. I think I got better as I went along. Now, you might be thinking that’s great Brian, but why whales? Why now? Well, if you didn’t already know, Erin and I have a little boy due in September. We have been exploring a whale/nautical theme for his room, so I have been learning to draw whales. It has been fun to draw again. I don’t think I have really done much drawing since high school. 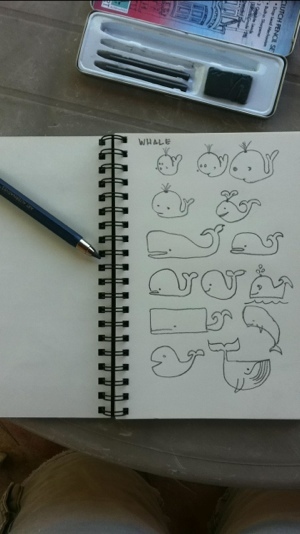 The thing that amazed me was that there are so many ways to draw a simple, cartoonish whale. I haven’t even scratched the surface here. Which one is your favorite? Congrats! I heard that you might be expectig a while ago but wasn’t sure. Thanks. Erin’s due at the end of September. I like the very last one, and the one that is third from the top on the left-hand side, the long one (which is similar to the larger one with the “It’s a boy” below it). Groovy, man.